Bobby Reece is originally from Valdosta, Georgia, and spent 8 years in the US Navy as a nuclear operator on submarines. Reece served on the fast attach submarine USS Louisville out of Pearl Harbor, and was an instructor at an operational teaching nuclear power plant in New York. While in the Navy, Reece completed a BA in Geology in 2008 at Skidmore College in upstate New York. After the Navy, Reece made the trek down to Texas, where he completed his PhD in Geosciences at the University of Texas at Austin studying deepsea sedimentation and tectonics utilizing seismic and other geophysical data. Reece started at Texas A&M University as an Assistant Professor in August 2013. Reece’s current research includes the study of plate boundaries and processes associated with climate-tectonic interaction, evolution of oceanic crust, development of carbonate systems, and high-resolution studies of marine hazards. He utilizes most types of marine geophysical data, but specializes in seismic reflection, tomography, bathymetry, high-resolution techniques, and seismic-core integration. 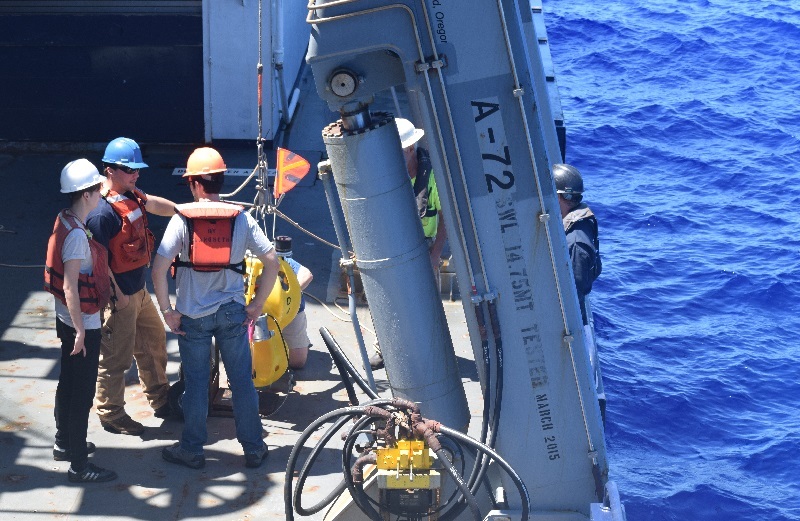 In January 2015, Reece set sail on the NSF academic seismic vessel, R/V Marcus Langseth, for a two-month expedition to study the evolution of oceanic crustal evolution over a transect that spans 70 million years of oceanic crust. Funded by NSF in a three-year grant, the data acquisition included work with ocean bottom seismometers, and a 1500 km continuous seismic reflection profile. This dataset also supports a current proposal to the International Ocean Discovery Program (IODP) to drill into the sediments and crust to study the history of hydrothermal alteration, variability in subseafloor hydrology, the seafloor biosphere, and changes in ocean currents with implications for climate. This is a large and multidisciplinary team and Reece is very excited to be a part of leading this project. Reece has also been funded by NSF to study deepsea sedimentation in the Gulf of Alaska through an integration of IODP drilled core, logs, and seismic reflection data, as part of a broad effort to understand the feedback between climate and tectonics in southern Alaska. For a subset of this project, in August 2016 Reece and collaborators collected high resolution seismic reflection and bathymetry data in Icy Bay and Taan Fiord in Southern Alaska. The team utilized a 24 channel streamer and sparker source maintained by the Reece lab at Texas A&M, and will use the results to study sedimentation in a rapidly changing glacial system. In addition to research, since arriving at Texas A&M, Reece has also prioritized teaching through research and hands on application. Reece has integrated current research projects into case studies and lab exercises in the undergraduate Global Geophysics course, as well as the graduate level Seismic Interpretation course. Reece has also worked hard to provide research opportunities for undergraduate students. He currently hosts undergraduates on every project in his lab; four of these students presented their research at the AGU Fall Meeting in San Francisco, California in December 2016. Reece was recognized for his teaching last year, and is the 2016-2017 Montague-Center for Teaching Excellence Scholar for the College of Geosciences. This scholarship is awarded annually by CTE to one early career faculty member in each college across the University. The award comes with a $6500 budget that Reece will use to improve hands on teaching experiences in geophysics, including with field equipment and physical models. Reece enjoys being a professor at Texas A&M, and is very happy to be here in the Department of Geology and Geophysics. In his free time he loves spending time with his wife Julia, also a professor in Geology and Geophysics, and their two-year old son Luca.